The fillings are generous and locally sourced. Quality is assured and of course any pork used comes direct from their farm. 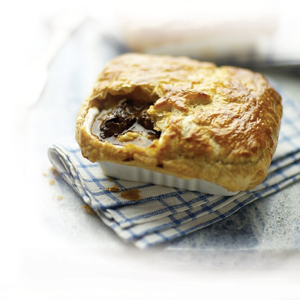 The range continues to include pork pies and clangers similar to a Cornish pasty. Not only that but they also cure their own bacon and make their own black pudding and sausages. Natural casings and only prime cuts of meat such as the shoulder or belly are used which results in truly succulent sausages. Farmhouse Gold are our most popular. The only hiccup with Simple Suppers is that because they are a small family business they deliver once a week on a Thursday. So if you visit after the weekend we are occasionally sold out. 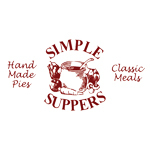 Why not stock up in advance as all their pies with the exception of the pork pie can be frozen on the day of purchase? Or if you prefer, we are happy to take orders.